As I mentioned in my last article on the famous, 1909, Waite-Smith Tarot, I often find in books and articles that Waite is referred to as the designer of the deck. I do not believe that the term designer should be applied to Waite. To design, in its artistic meaning, is to create a visual plan for a work of art or to actually create the work. One cannot design a visual work of art by describing it in words and Waite was not known to possess a talent for visual communication. He hired Smith to design the deck because she did possess the talent. The question then becomes; How involved was Waite in this project? In his memoirs, Waite specifies that he paid special attention to the direction of three trumps but we cannot assume that he had as much control over all of the cards. 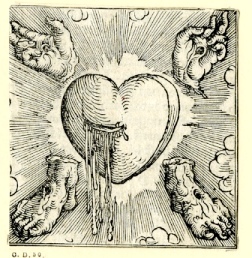 It is most probable that for the Major Arcana Waite described the design that he desired for each card, complete with the symbolism it should contain and the significance of each symbol, and, then, he would have stepped out of the picture and let Smith work in her usual spontaneous and intuitive manor. Waite seems to have given Smith more freedom to express her visionary talent in the creation of the fifty-six Minor Arcana, which comprised the bulk of the work. When the art was complete, Waite looked at each piece and wrote a description for his book, The Pictorial Key to the Tarot. That the art came first and the descriptions second, is demonstrated by the fact that Waite at times misinterprets what he is looking at. As this is not always obvious to Wait’s readers, I am often asked to give examples. Therefore, I will describe some differences between the words and the art here. This is an image that borrows heavily from Christian iconography. The cup seems to be an allegorical image of the Grail. The dove is the standard Christian symbol for the Holy Spirit and the host with the cross is the body of Christ. This Grail is marked with the letter “M” representing Mary. The Grail is being depicted as the body of Mary, which is a vessel receiving the body and blood of Christ. The five streams represent the five wounds, which Christ bled at his crucifixion to bring eternal life to the world. 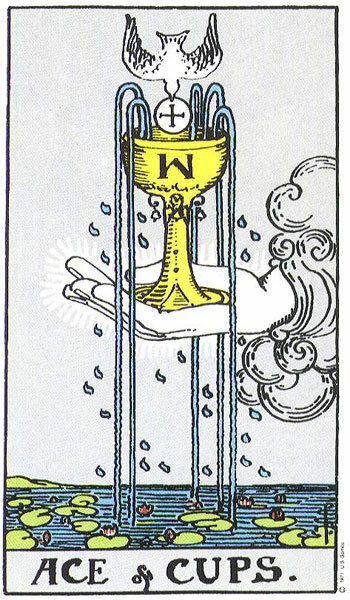 It appears that, Waite would prefer to connect the Grail to the fountain in the center of Eden from which four rivers flowed. He, therefore, saw only four streams. 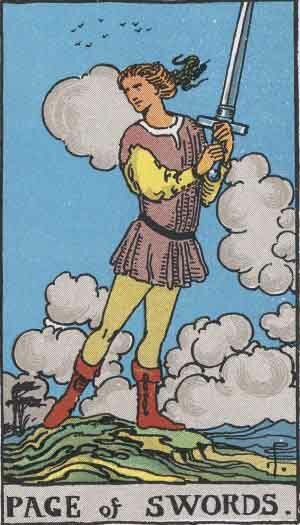 On Smith’s Page of Swords the trees and clouds are blowing in the wind, birds are flying and the ground seems to be swirling. Everything in the design seems to be moving except the page himself, who stands defiantly in the center on a rise in the earth with his weight on one foot holding his sword aloft and looking over his shoulder. Waite, however, says that the page is “in the act of swift walking.” Even if his right leg, the one not bearing weight, is preparing to swing forward and allow him to step off the rise, this is not a depiction of walking but of a pause in the walk a moment of stillness in the midst of this commotion. 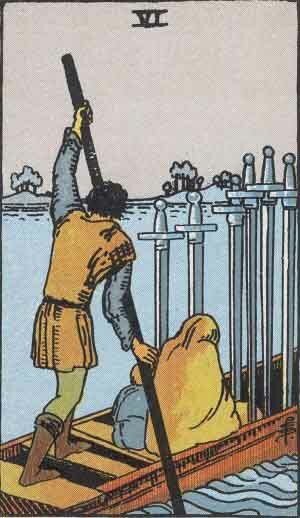 Smith’s image for the Eight of Pentacles is based on The Sola Busca Tarot’s Six of Coins which represents a metal worker raising the shield like disks that are the suit symbols for that deck. 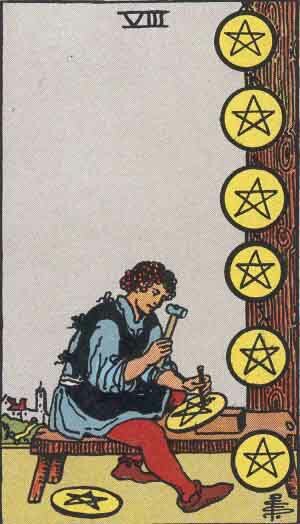 In Smith’s design, the craft worker is sitting at a bench and using a small hammer to chase the stars on the metal pentacles. When he is done, he hangs them from a board possibly to display them for sale. Waite calls him “an artist in stone at his work.” But, the pentacles are too thin for stone, his bench is too light, the pentacles are hung by a cord or a wire that would be difficult to attach to stone and too weak to hold its weight, and they are colored yellow, representing gold. Waite wanted him to be the apprentice to the artist on the Three of Pentacles, who is carving stone. 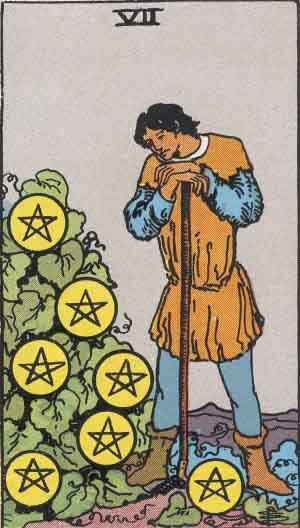 The man is doing production work in contrast to the individually creative work of the artist on the Three of Pentacles. There are other examples in which Waite’s descriptions of Smith’s illustrations seem vague or uncertain but the ones I have listed here are examples where I strongly disagree with Waite’s interpretation of the picture. I feel that these examples demonstrate that Waite was not the author of these designs and that he only commented on them after they were complete. All of these examples are cards from the four minor suits but there are also examples of discrepancies in Waite’s descriptions of the trumps. But because this discussion will be more involved, I will save it for my next article. Could it be, though, the other way around? Could Waite have written these descriptions which Smith used as springboard for her work? She took the words as guides, but the design itself emerged with its own unity (as designs will do) and sometimes this required a slight deviation from the notes? That would be highly unlikely. First, that is not the way the relationship between an illustrator and an author works. And, second, Smith was not even commissioned as an illustrator but as the designer. Waite says this and all of the early descriptions of the deck by the publisher say this. The editor even mentions that Smith researched early decks for her designs. 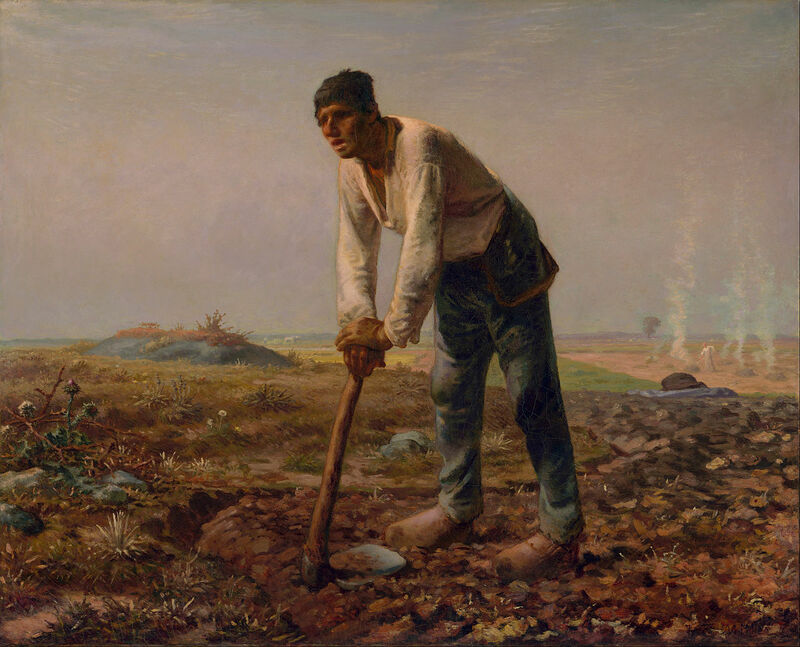 Take the Seven of pentacles for example, If Waite wrote that the man is leaning on his staff, why would Smith change it to a hoe and place him in a garden where the tool belongs for him to have completed his work? It is more likely that Waite misinterpreted the picture. This is a fascinating article. Not sure it makes a strong case for a clueless Waite. It is at least *as likely* that Waite provided a pre-conceived interpretation supposed to inform the art, or developed separately from the art, as him misinterpreting the art. In his memoirs Waite only expressed this much concern for the symbolism of the Majors. 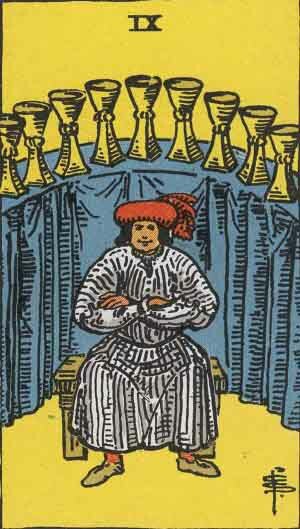 In the introduction of The Key to the Tarot he is apologetic about writing a book on divination, as if it beneath him. Even with the majors, there are only three cards that he mentions that he wanted to have more control over. And this is only because he didn’t want Smith including symbolism that he felt would violate his oath of secrecy to the Golden Dawn. It is improbable that after giving Smith free-rain to work in her usual intuitive manner (which is his stated reason for hiring her) That he would refuse to change one word in his description to harmonize it with the picture. It would make sense if the artist drew from contemporary or historical/mythical artwork for much of the minor deck, eg in the `3 of Cups` from Lucas Cranach.